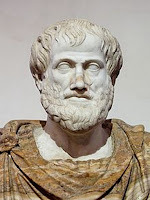 As far back as Aristotle* and perhaps beyond, the scientifically-inclined nerds of ancient days would cubbyhole plants and animals as a means to better understand them. In botany, more recently, plant families such as Rosaceae, Pinaceae and Leitneriaceae all end in aceae, and that is the Latin feminine plural of aceus meaning "relating to, belonging to, having the nature of, or resembling." As with potātoes-potătoes, tomātoes-tomătoes, the pronunciation of aceae varies, and not wanting to humor anyone I use the suffix in written communication but it is not in my verbal diction. *I recommend The Lagoon – How Aristotle Invented Science by Armand Marie Leroi. Leitneria floridana ("corkwood") is the sole member of Leitneriaceae*, a deciduous shrub or small tree found in the southeastern USA. 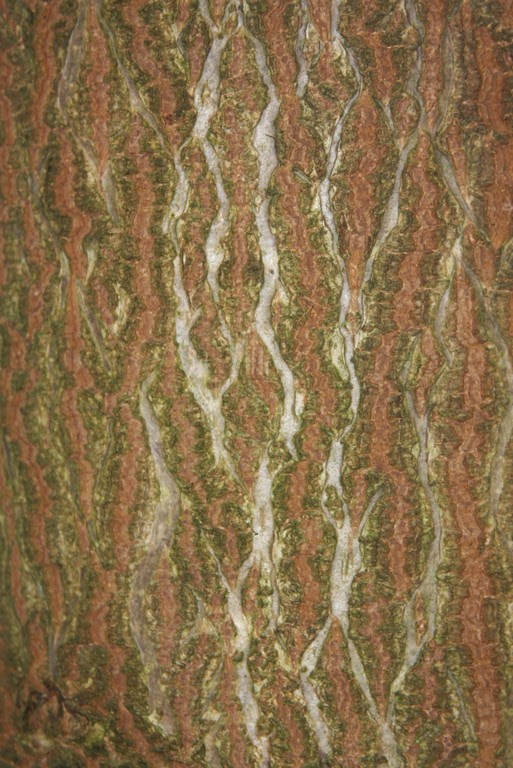 The common name is because its extremely light wood is less dense than that of cork. It was named in honor of the German natural scientist E.F. Leitner (1812-1838) who botanized in Florida until his early demise (at age 25) in a skirmish with Seminole warriors. *Recent genetic research suggests it could belong in the Simaroubaceae family in the Order of Sapindales (soapberries); i.e. it would be botanically related to the maples. Being related is relative according to my uncle. For example the genus Asimina is the sole member of Annonaceae, and that would suggest that there's really not much else like it. By contrast it shouldn't surprise you that two members – out of many – in the Rosaceae family, Malus and Crataegus, are quite similar. It doesn't take a botanist to know that because even a child can see the fruits, flowers and trunks look alike. 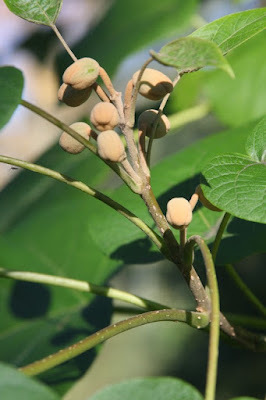 Asimina triloba is native to eastern North America and the common name "paw paw" is probably derived from Spanish papaya. With a sweet custard-tasting fruit it was a favorite dessert of George Washington, and Thomas Jefferson planted it at Monticello, his home in Virginia. Before you gobble too many you should know that Asimina contains the neurotoxic chemical annonacin – hence the family name Annonaceae – which has been linked to palsy (PSP) and Parkinsonism. 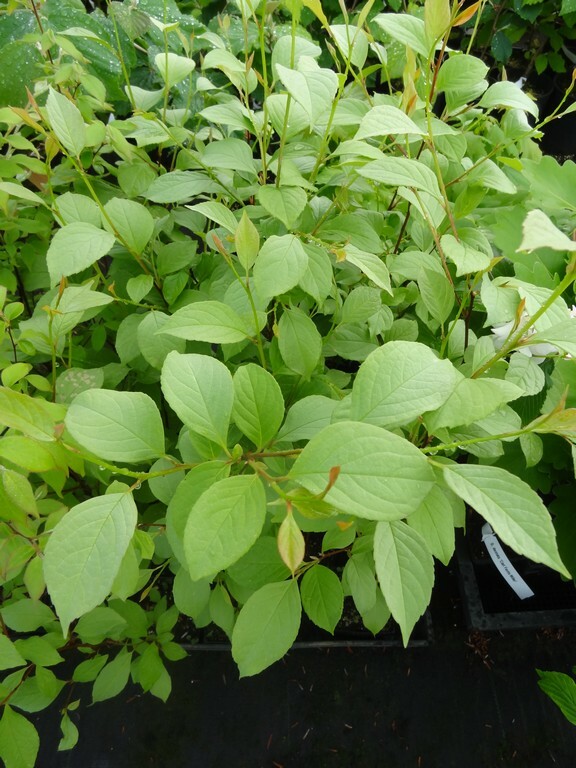 The genus Itea is also a sole member in its family, Iteacea, and it is a genus of deciduous and evergreen shrubs mainly from eastern Asia. One exception is I. virginica from America, a small deciduous shrub which produces long banana-shaped racemes of fragrant flowers in summer. I see a section of the dwarf 'Little Henry' at the neighbor's bankrupt nursery, and I have to admit that I'd like one for my garden. His should have been shipped this past spring but they still remain, and I don't know – maybe his price is too high. In their root-bound state they are already starting to color deep red-purple. 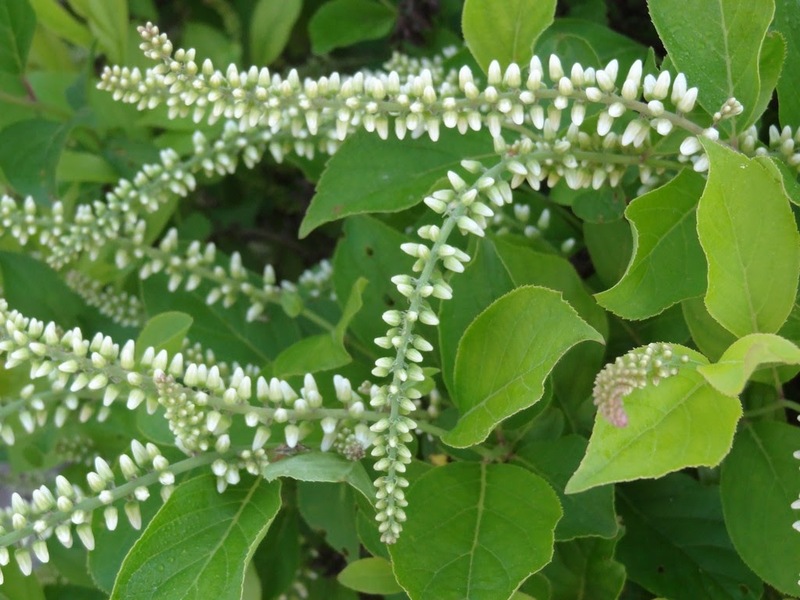 The origin of the name itea is from Greek for "willow," and I guess the flowers on the neighbor's plants do resemble those of a willow (Salix). 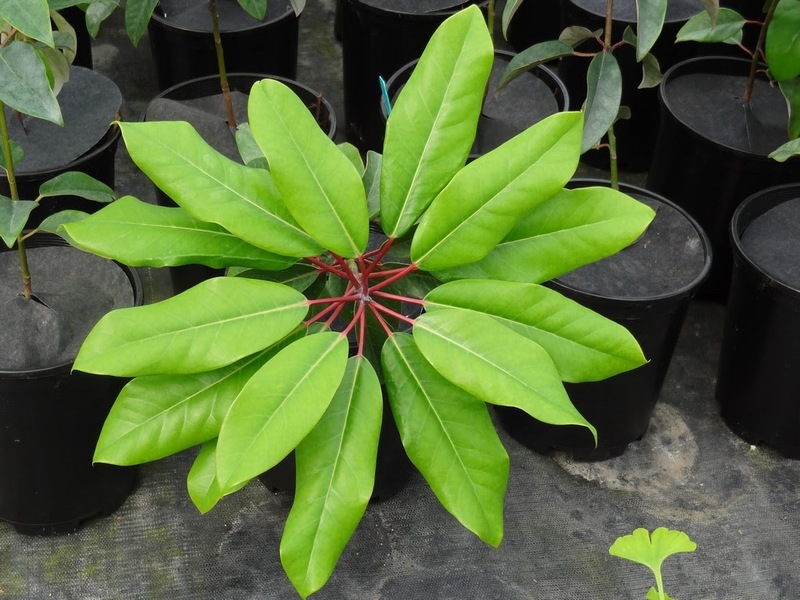 Another interesting family with a sole genus – Helwingia – is Helwingiaceae. 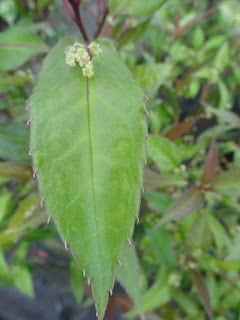 We grow H. chinensis, and though the flowers are unimpressive, they do grow epiphyllously (if that is a word), in other words they sit atop the mid-vein of the leaves. More than anything it is a curiosity and I like to point it out to visitors. "Plants can be weird, eh?" I grow two cultivars of the evergreen, 'Big Leaf Form (male)' and 'Narrow Leaf Form (female)', though I'm not certain if these are official cultivar names. 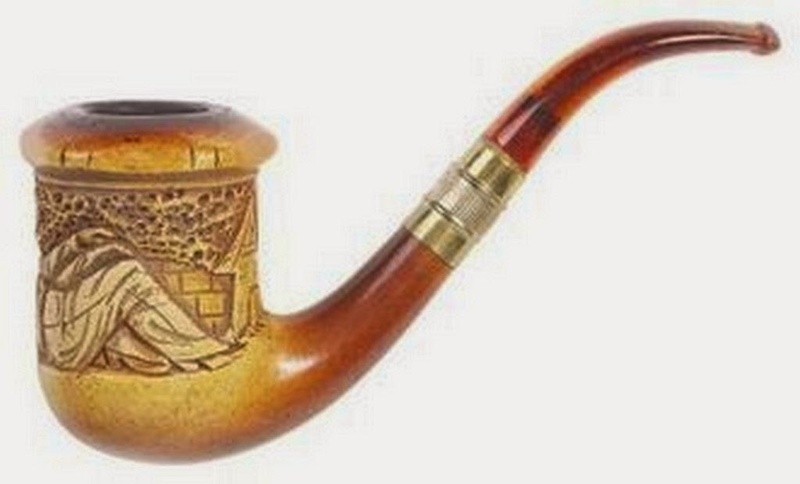 They originated from a Dan Hinkley 1996 expedition to Sichuan, China. 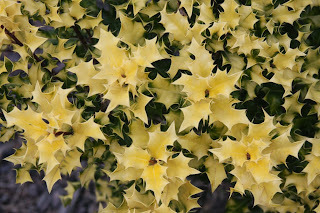 I keep my bushes in a greenhouse in winter as they have not proven hardy outdoors. 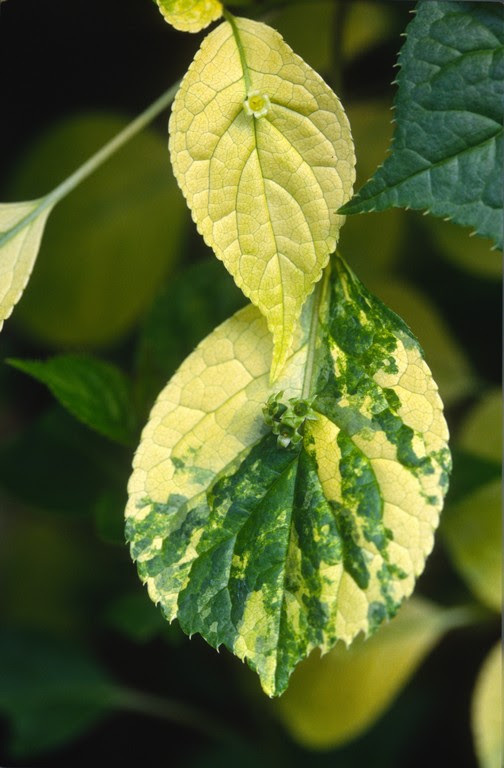 I have seen a variegated form in Japan but I'm not certain if the variegation is stable, or even if this selection is in America yet, but I would buy one if I could find it. 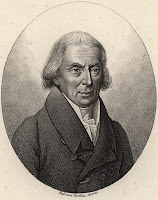 The genus was named for Georg Helwing (1666-1748), a Lutheran pastor and botanist, but I doubt if he ever saw the plant. 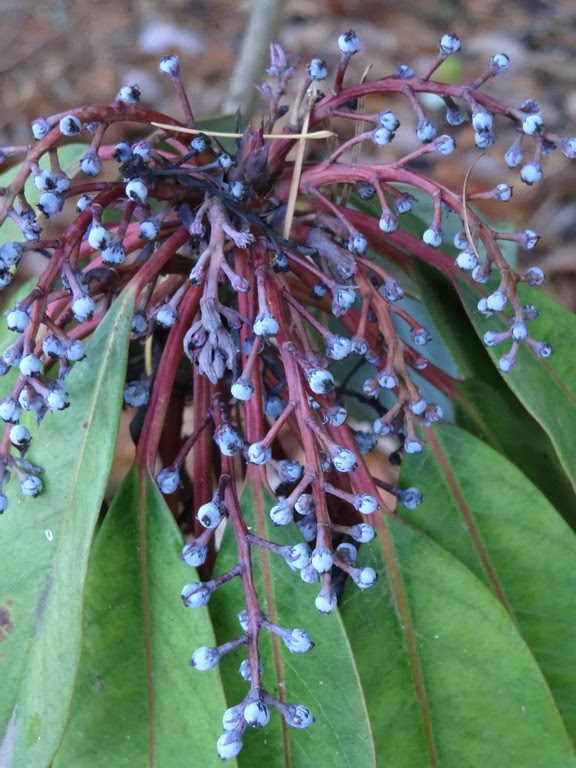 You might suspect that the Aquifoliaceae family's name was coined for water-like or glossy foliage...that Mahonia aquifolium refers to its wet-looking or shiny foliage. But wrong. The aqui in these cases refer to the barbs on the leaves...that somewhat resemble the beak of an eagle. I have laid this out in previous blogs, and though an interesting subject I won't go into it again. 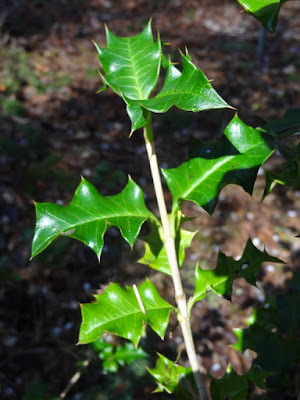 In any case, it is surprising to me that the Ilex genus is the only member of Aquifoliaceae. 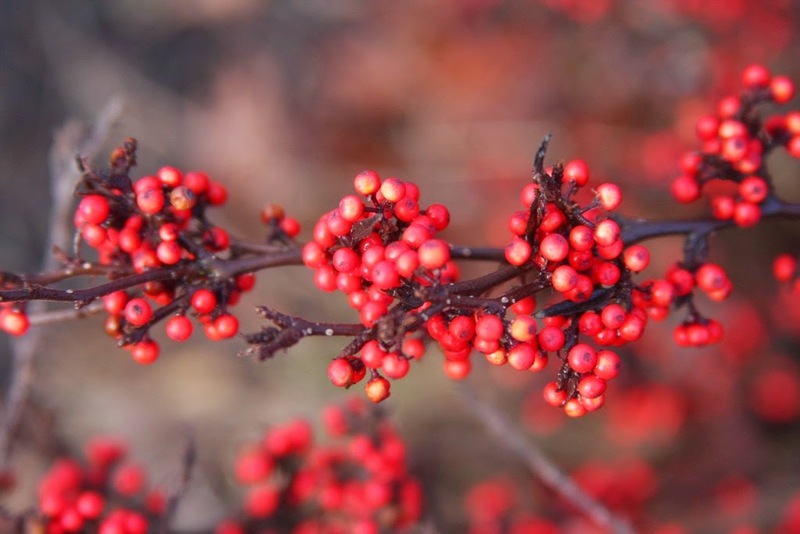 Ilex – the "Hollies" – is a huge genus of about 400 species of evergreen and deciduous trees and shrubs and we grow a number of them. Ilex crenata 'Dwarf Pagoda' is a wonderful evergreen (dark green) plant that won't outgrow its place in the garden. 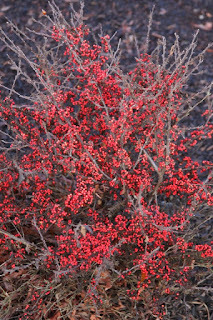 Ilex aquifolium 'Night Glow' never fails to amaze me for its luminosity, especially in winter. Ilex serrata 'Koshobai' (Japanese for "peppercorn") is a deciduous bush with the tiniest of red berries...borne in profusion, a perfect little potted treat for the Holiday dining table. 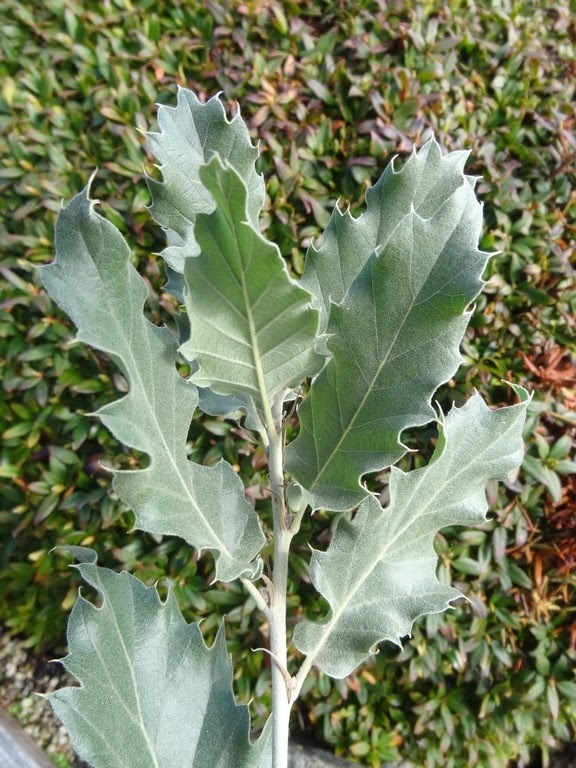 Ilex – the Latin name first recorded in the 1500's – is the name for the "Holm oak," Quercus ilex, an evergreen from southern Europe that has foliage resembling that of the holly. 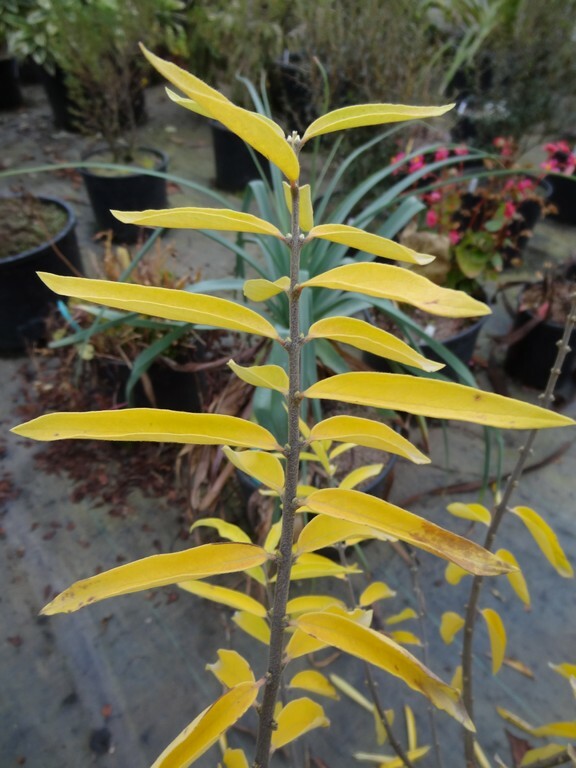 The only member of the Argyrophyllaceae family is the Corokia genus. 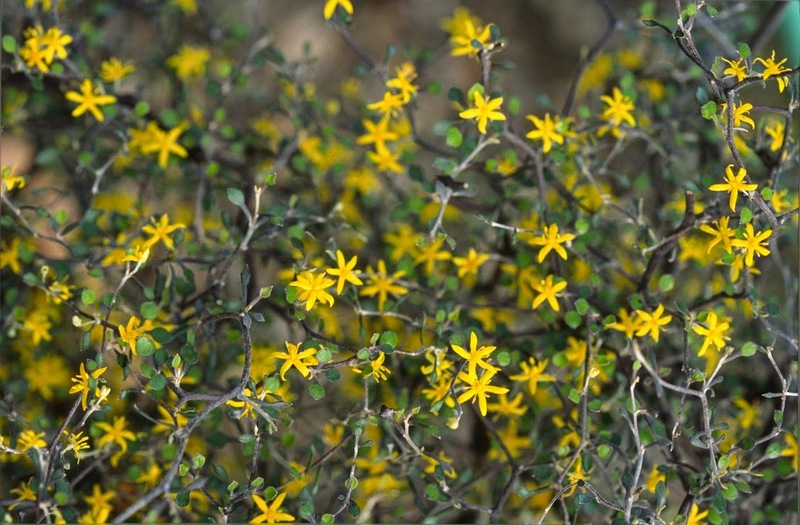 There are three species of Corokia, all from New Zealand, but I don't care for two of them. 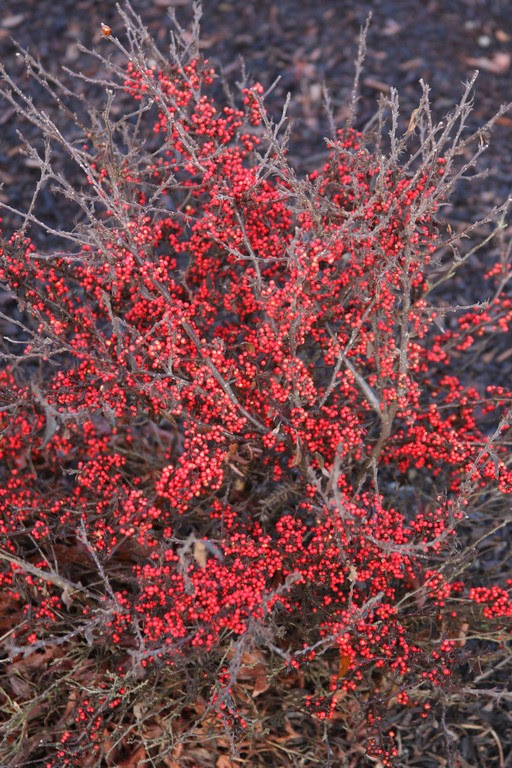 C. cotoneaster, however, is a fascinating shrub or small tree and we've been growing it for about 35 years. 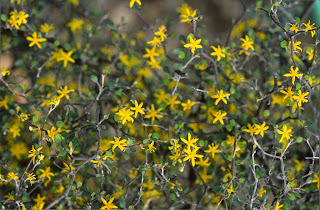 It is commonly called the "wire-netting bush" due to contorted branches and tiny silver leaves. Small yellow flowers appear in spring and orange fruits follow in autumn, but it is the curious branching that gives year-round appeal. 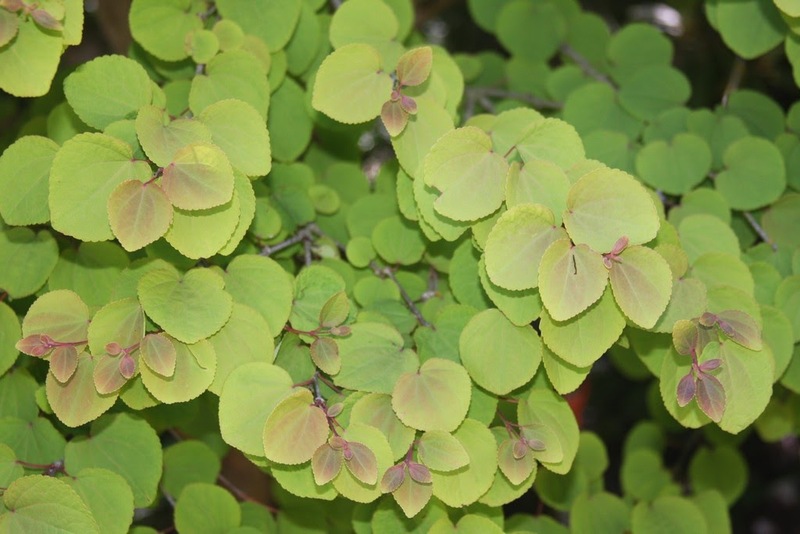 The genus name is derived from Maori korokio while the family name refers to a group of plants with silver foliage. 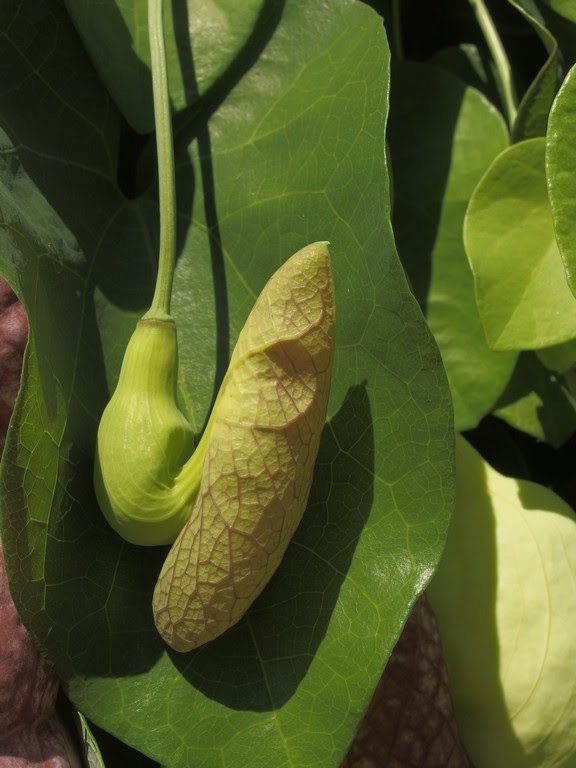 At some point the specific name of Aristolochia durior, in the Aristolochiaceae family, was changed to A. macrophylla. I'm not sure what prompted the change but now I have an added task to relabel my vine. It is a vigorous species that was introduced in 1763 from eastern North America by the early American botanist, horticulturist and explorer John Bartram. * The flowers are fun tubular things with a crook that give rise to the common name of "Dutchman's pipe." The family and genus name is derived from Greek aristos for "best" and locheia for "childbirth" or "childbed" due to its ancient use in childbirth. *Linnaeus called him "the greatest natural botanist in the world." Bartram discovered and introduced a number of American plants including Kalmia, Magnolia, Rhododendrons and a wonderful flowering tree later named Franklinia alatamaha. 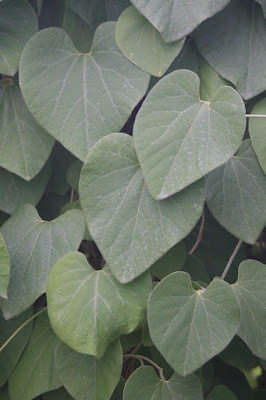 I guess there is nothing else botanically similar to Cercidiphyllum, except that in appearance there are many trees with round leaves (Cercis, Disanthus etc.). But Cercidiphyllum, or "Katsura tree," is unique to the Cercidiphyllaceae family. 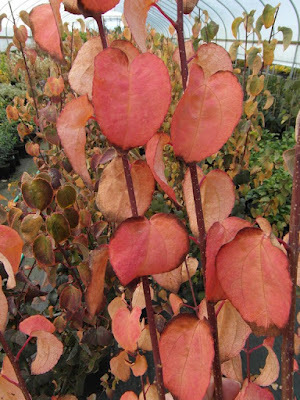 We grow a number of forms such as 'Red Fox' ('Rot Fuchs'), an upright with red-purple foliage and 'Morioka Weeping', a large-growing tree with pendulous branches. The latter might have an invalid name due to the combination of a Japanese name with an English name. 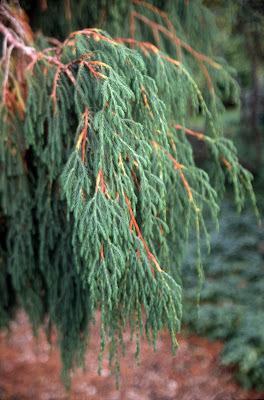 'Morioka Weeping' originated at the Ryugen Temple in Morioka city, and according to Hillier in the Hillier Manual of Trees and Shrubs, the original tree is respected as a natural monument, and that, "Incredibly, this tree itself originated as a sucker in 1824 from the stump of a previous large tree." I wonder about that, that maybe a new seedling germinated on or near the previous dead tree. Anyway it's a good story and I would love to visit the temple. 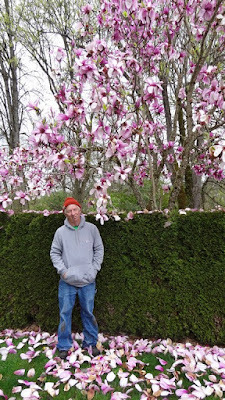 The next best thing is to travel to Springfield, Oregon and see the large specimen at Gossler Farms Nursery. 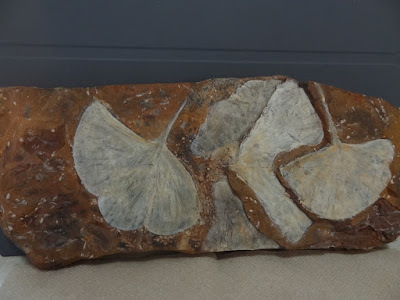 No one even remotely involved with plants would suppose the Ginkgoaceae family to contain anything other than Ginkgo, and besides the Ginkgo is a monotypic genus as well. 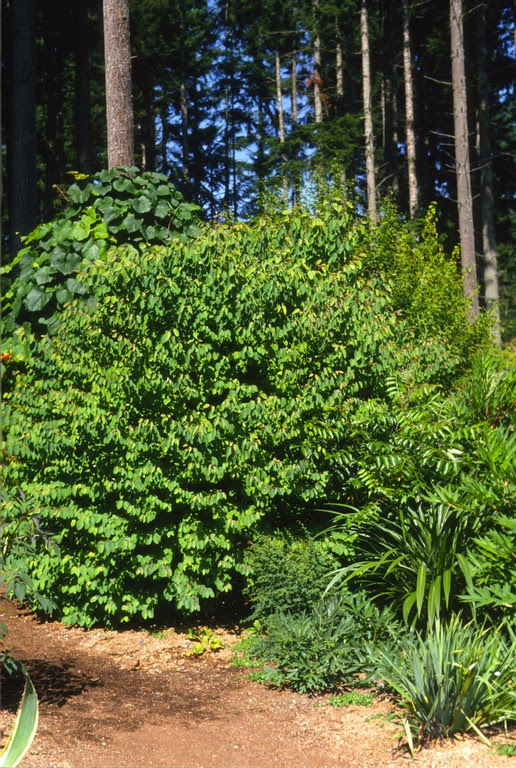 According to Hillier, "G. biloba is the sole survivor of an ancient family whose ancestors occurred in many parts of the world (incl. the British Isles) about 190 million years ago." I have a wonderful fossil from the Paleocene* Period, found in Morton County, North Dakota. I am a huge fan of Ginkgo and have grown cultivars my entire career. When my daughter H. was two-years-old we were walking hand-in-hand down a Portland, Oregon street. She spotted a single golden leaf on the sidewalk and announced, "Ginkgo biloba," then looked up at the tree's canopy. When my older children heard the story they were worried that perhaps I was brainwashing the poor child. *The name Paleocene comes from ancient Greek for palaios for "old" and kainos for "new," referring to the fauna that arose then. 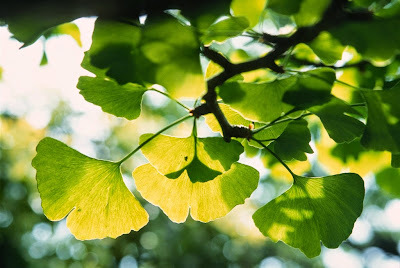 Conifer authors include Ginkgo in their conifer books, and Rushforth in Conifers suggests that, "Ginkgo has survived until modern times in two remote areas in China, one on the border between Zhejiang and Anhui provinces in the east and the other further west in Guizhou." Earlier in my career my understanding was that Ginkgo was extinct in the wild, so I'm happy to learn of its wild survival. 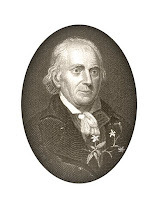 It was Linnaeus who bestowed the name upon the genus. 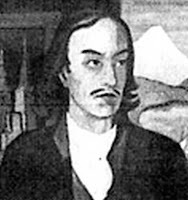 It is known in Japan as ginkyo or "silver apricot," and it was the German physician and naturalist Engelbert Kaempfer (1651-1716) who visited Japan in 1691 and brought seeds back to Europe. 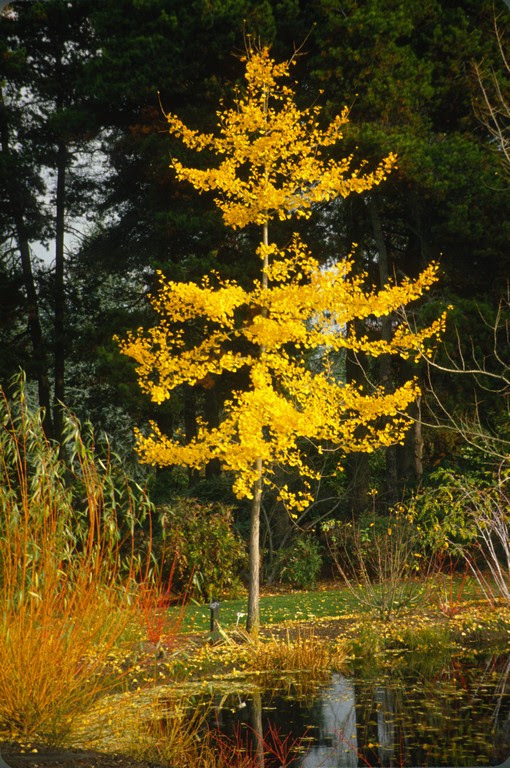 As with Ginkgo there is really nothing like a Sciadopitys, and you can't place it in the Pinaceae family even though it is commonly called the "Umbrella pine." 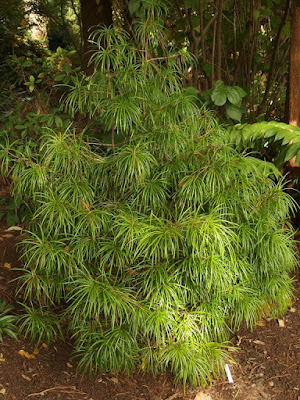 Sciadopitys verticillata is a monotypic genus, the only member of the Sciadopityaceae family, and it is known as koyamaki in Japanese. The botanic name is derived from Greek sciado meaning "shadow"* and pitys meaning "pine," and of course the specific name verticillata refers to the needle whorls. Its native range is southeastern Japan at mid elevations with high rainfall and humidity, and so it is absolutely thrilled to grow in our greenhouses where it defies its reputation to be slow-growing. I invite you to look closely at a Sciadopitys because the needles that conduct photosynthesis are not technically the leaves; rather the true leaves are small scale-like growths that hug the branches. 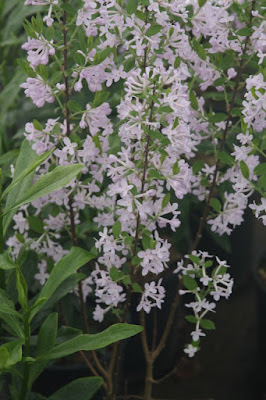 We grow a number of cultivars which I have featured over the years in the Flora Wonder Blog so I won't go into them now. Suffice to say that the straight species used to be in high demand twenty or thirty years ago, but not so much any more. My customers will pounce on any named cultivar, however, so you could say that the gardening elite has become more discerning. 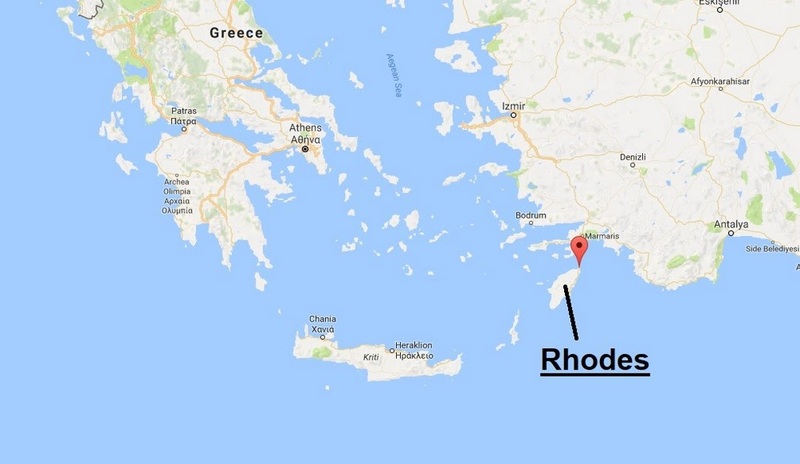 *Another derivation is the Greek "skias" or "skiados" for "umbel." 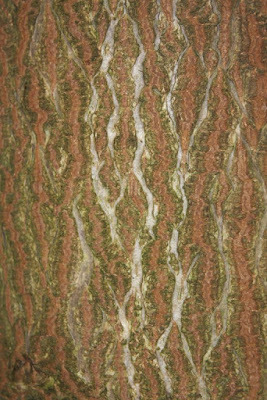 A few plantsmen pronounce Sciadopitys as "skee-a-dopitis" while most say "sigh-a-dopitis," and I include myself in the latter. 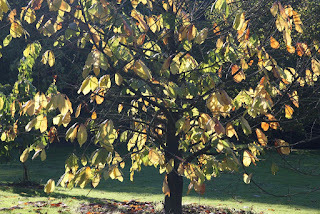 I grow a tree, Euptelea pleiosperma, but I have never once uttered its name. I bought 20 from a seedling grower who advertised that it was a root weevil magnet, that if you placed one in the middle of each greenhouse all of the weevils would reside near it, and then you would only have to spray one small area. I took the bait and put one in each greenhouse, but after a full season not a single leaf had been notched. 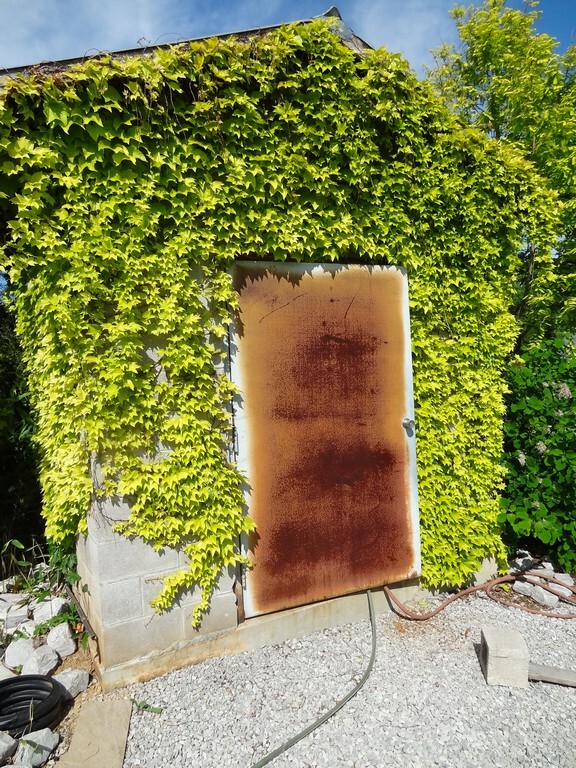 It turns out that the Epilobium weed was much more of a magnet, for a couple of houses showed evidence that root weevils had munched on the weed. Anyway it took a few years before I was able to sell 18 of the trees, and then I planted the final two in the arboretum. 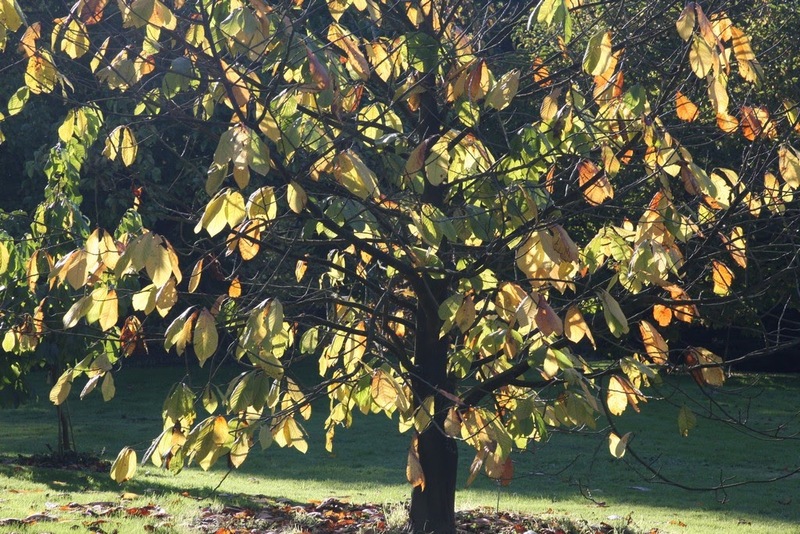 Euptelea is no one's favorite tree and most would describe the genus as a BIO tree (Botanical Interest Only). In any case, it is the sole member of the Eupteleaceae family, and I guess you would pronounce its name as yoop tel ea. The generic name is derived from Greek eu for "well" or "handsome" and ptelea for the appearance of the fruits resembling the "elm." It comes from the eastern Himalaya and western China, and though it was introduced over 100 years ago, I challenge you to find even one in an American landscape or public park. BIO indeed. Daphniphyllum looks like an evergreen cross between Salix magnifica ("Wilson's willow") and Rhododendron decorum, but it's distinct enough to be the only member of the Daphniphyllaceae family. Despite its name,* it doesn't even look like any Daphne that I know. The specific name used to be macropodum, then we were told that it's himalaense subsp. 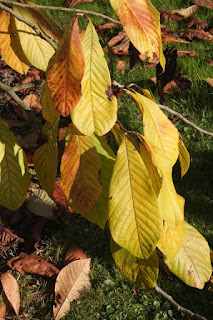 macropodum – which is a lot to fit onto a label – but now Hillier is content with just macropodum. It is said to thrive in half shade (Hillier) but at Flora Farm I have a number of them growing happily in full sun, and remember we reached 106 degrees F this past summer. I grow three distinct variegated forms of Daphniphyllum, and all three originated in Japan. Nevertheless the nomenclature is murky and I wish an expert would help me to straighten it out...in other words, what are their names in Japanese? One came to me as simply 'Variegated', but that can't be right. 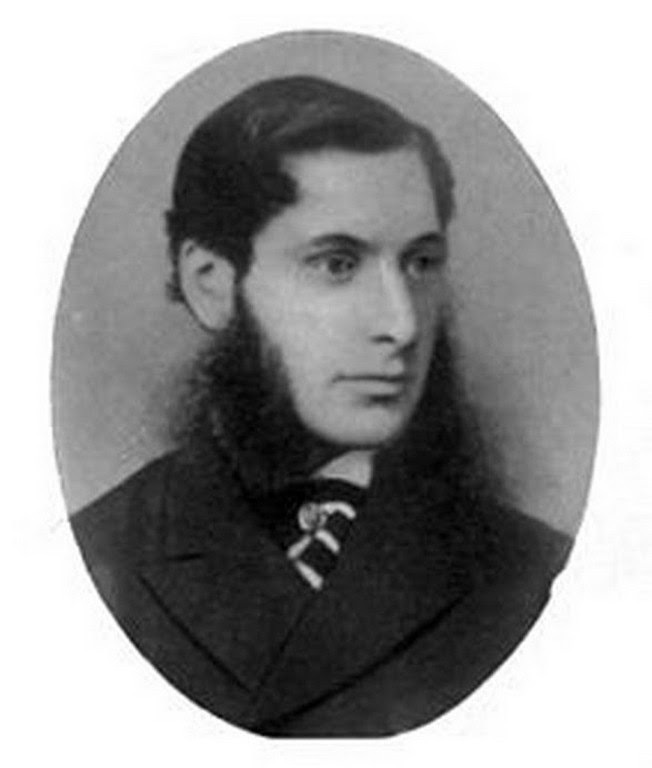 *The generic name was coined by Karl Ludwig von Blume (1796-1862), a German Dutch botanist. I've never grown a Paulownia, the sole member of Paulowniaceae, and all of the photos above were taken at other botanic gardens. 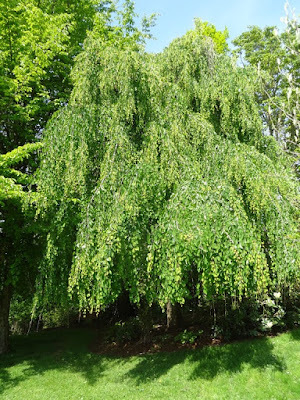 It was first described by Siebold (originally as Pavlovnia) and honors Anna Paulowna, queen consort of The Netherlands, and is commonly called the "princess tree" for that reason. 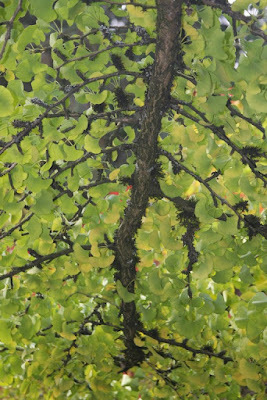 The genus comes from eastern Asia and it is a common roadside tree in China. 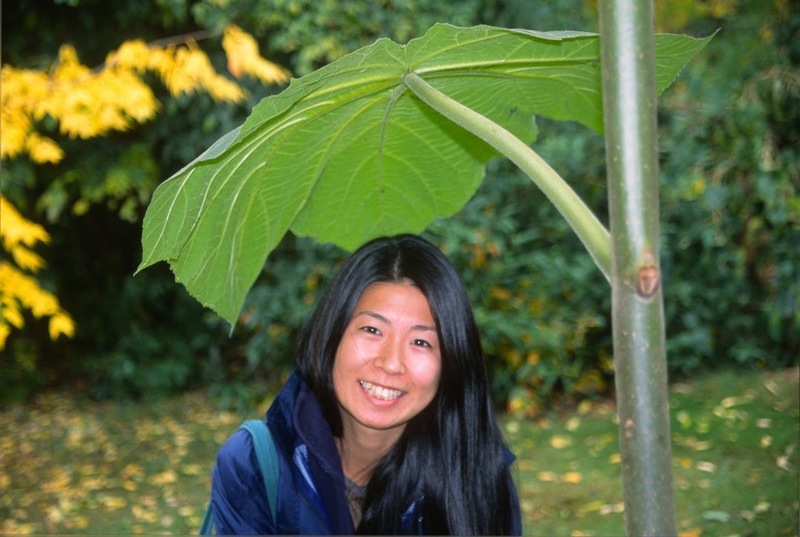 * In Japan P. tomentosa is known as kiri and my wife plays a koto instrument made out of Paulownia. *If happy, it can grow up to 20' in one year when young. One of the best parts of the Hillier Manual of Trees and Shrubs (2014) is the glossary at the book's end. Also botanical names are described which Hillier calls "fascinating and rewarding." Another section is Genera Included by Family, and that's the part that inspired this blog, though I'm fully aware that contentious botanists in other publications do not always agree with Hillier. To be sure some plant families contain genera that I have never heard of before, and it was a little bit of fun to look them up. For example Bupleurum in the Apiaceae family, Aextoxicom in the Aextoxicaceae family, Gelsemium in the Gelsemiaceae family and many others. 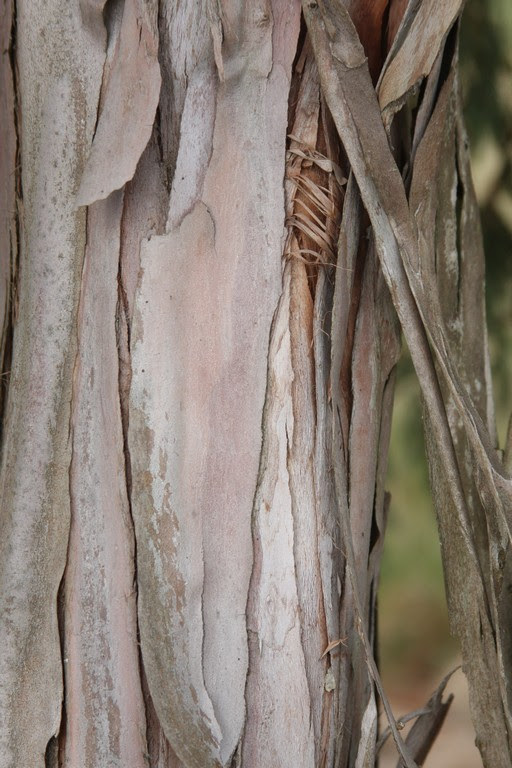 Carpodetus is in the Rousseaceae family, and according to Hillier: "A small genus of 11 species of evergreen trees found in New Zealand and New Guinea." C. serratus is the "Marble leaf. 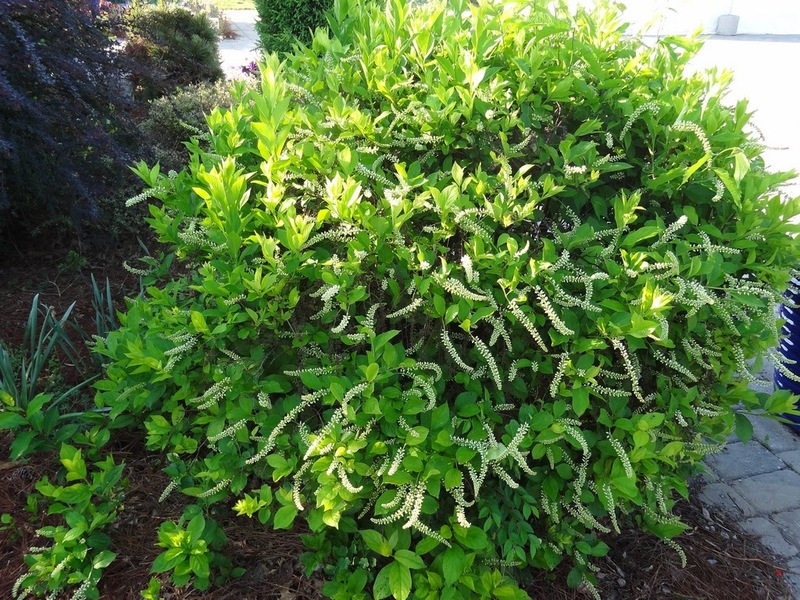 A graceful, evergreen shrub or tree to 10 m with small, yellow mottled dark green leaves and small, white flowers, in cymose panicles in summer." Of course I had to look up the meaning of cymose, and I discover that it's "Having flowers in cymes." A cyme is "An inflorescence where the terminal flower opens first, particularly referring to flat-topped inflorescences." One can go on-and-on about plants, and my wife wonders why I come to bed late. I regret, however, that by tomorrow I will have forgotten all about Carpodetus and most of the others. Yesterday I travelled with Seth to southern Oregon, and while he drove I enjoyed the autumn color -- mostly yellow. Acer macrophyllum, Populus and Salix were all vying with each other for attention. 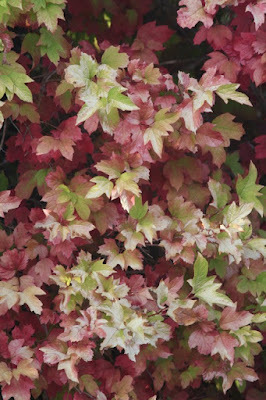 The above photo was taken from the bridge at the entrance to Kelleygreen Nursery, fellow growers of maples. 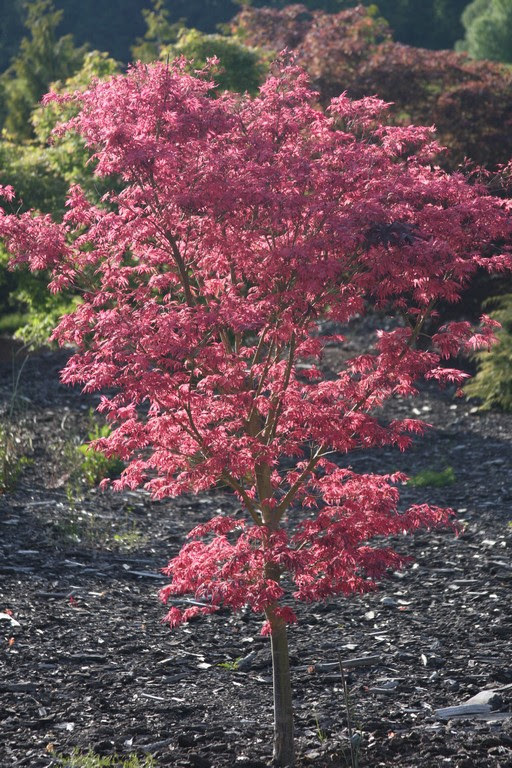 Thanks to Kevin and Jan for a nice visit, and besides I was able to bring home two new (for me) maples: Acer palmatums 'Scarlet Princess' and 'Baton Rouge'. 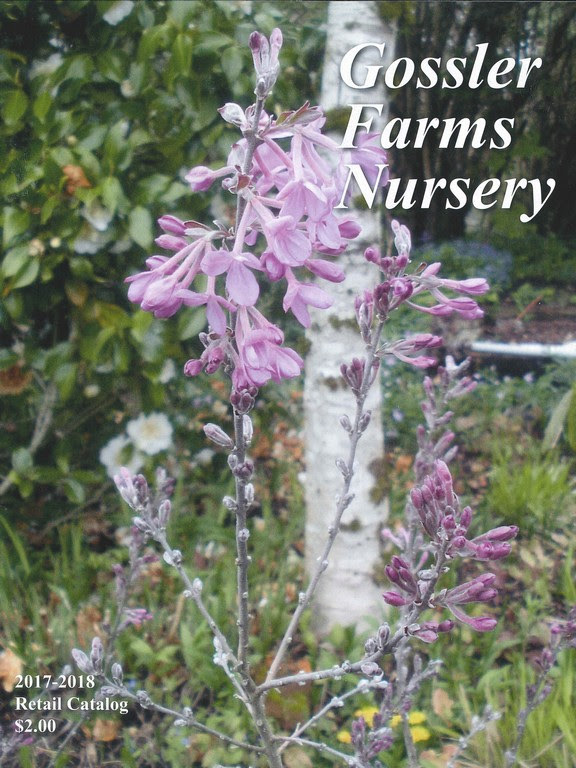 Last week I received my 2017-2018 Gossler Farms Nursery retail catalog and I didn't have to pay the $2.00 like it says on the front cover. 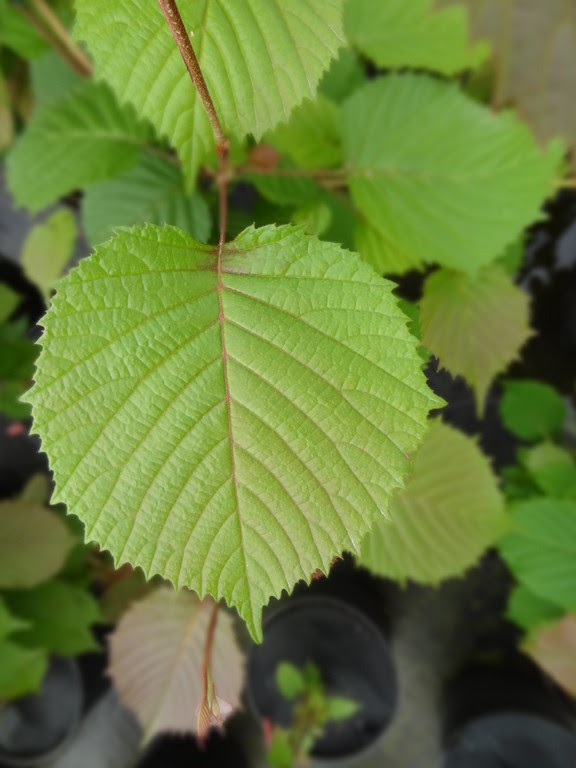 Roger Gossler visits and orders once or twice a year, which he has done since the beginning of time, and he “cherry picks” our best plants. Many nurseries hate it when customers attempt to do that, but at Buchholz Nursery we don't mind because we grow only the cherries anyway. Roger orders a wide array of plants from our three categories: 1) maples, 2) conifers and 3) everything else, but the common theme to his choices is that every plant is fun. Imagine that – making a living by peddling fun! Probably many of you Flora Wonder Blog readers already know about Gossler Nursery, but if you don't you are encouraged to head to gosslerfarms.com and get a catalog, even if he sticks you for the two bucks. 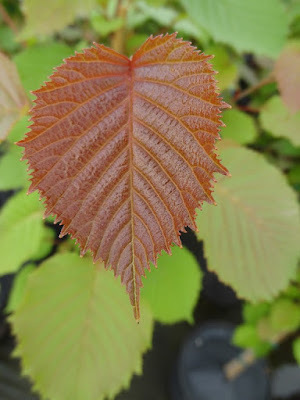 Many listings come from my nursery, such as Pinus contorta 'Chief Joseph', Chamaecyparis nootkatensis 'Sparkling Arrow', Ginkgo biloba 'Troll', Acer circinatum 'Baby Buttons', Acer palmatum 'Peve Starfish' and more, but in today's blog I will mention other choice plants that come from different sources, and you can be sure that I'll soon get my order in. 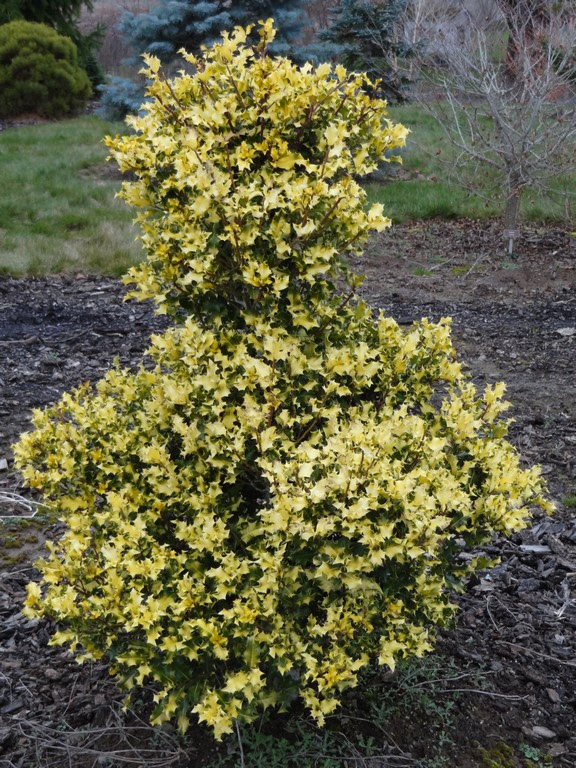 Gossler writes about Berberis replicata, “People always see this barberry and ask what it is and want it.” And why not, since it is a slow-growing evergreen shrub with narrow leaves colored rich purple on the new growth. Gossler states that his plant is 8' tall by 9' wide in 20 years, and in other areas it has proven hardy to -20 degrees F. Pale yellow flowers appear in May and black-purple berries adorn the shrub in fall and winter. 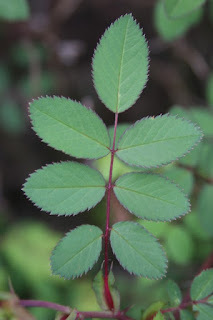 The specific name is due to leaf margins turned backwards (i.e. replicated). 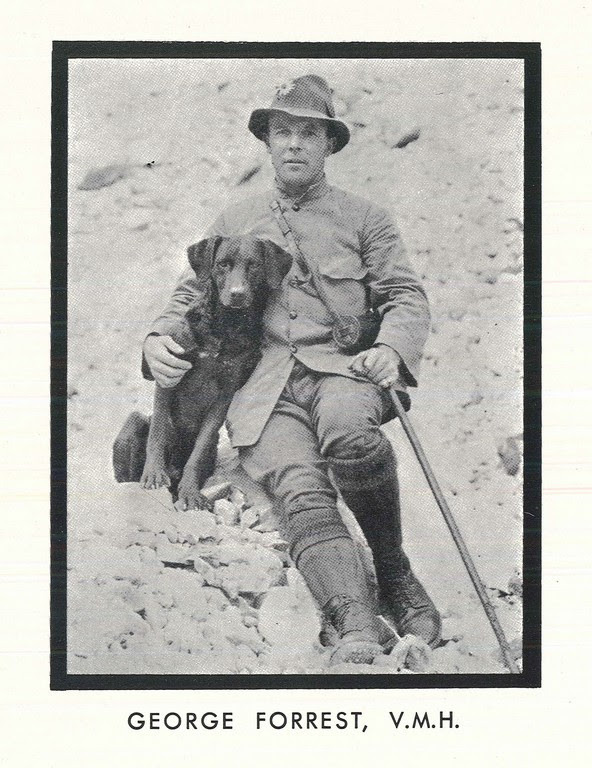 It was introduced from Yunnan, China by George Forrest in 1917 and it received an Award of Merit in 1923. 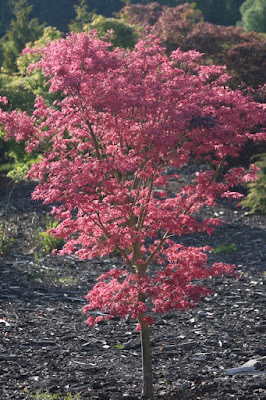 I used to grow a few Acer palmatum 'Shirazz', a New Zealand selection that originated as a sport on Acer palmatum 'Geisha'. 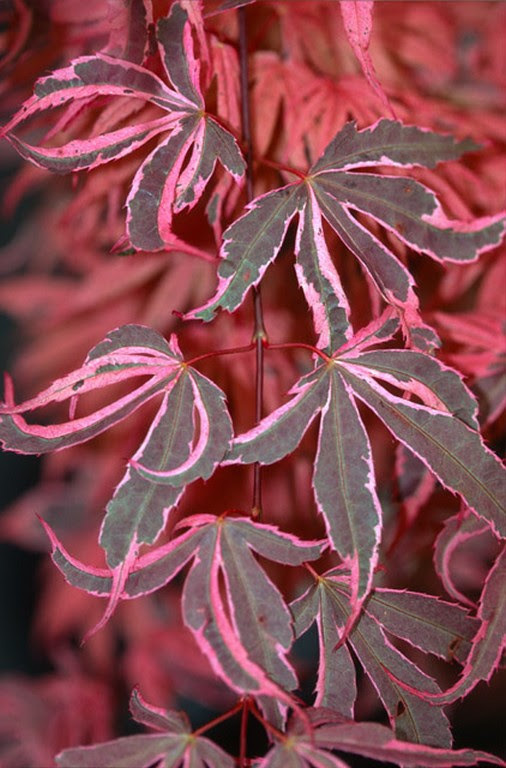 'Geisha' is notorious for reverting and sometimes the mutant growth can be attractive and a stronger garden performer than its parent. I know because my 'Geisha Gone Wild' discovery occurred at about the same time and in the same manner as 'Shirazz'. The only difference between the two is that 'Shirazz' is patented and mine is not, and my initial purpose to grow 'Shirazz' was to see if there was any difference, if one was maybe a little better than the other...but they're the same. 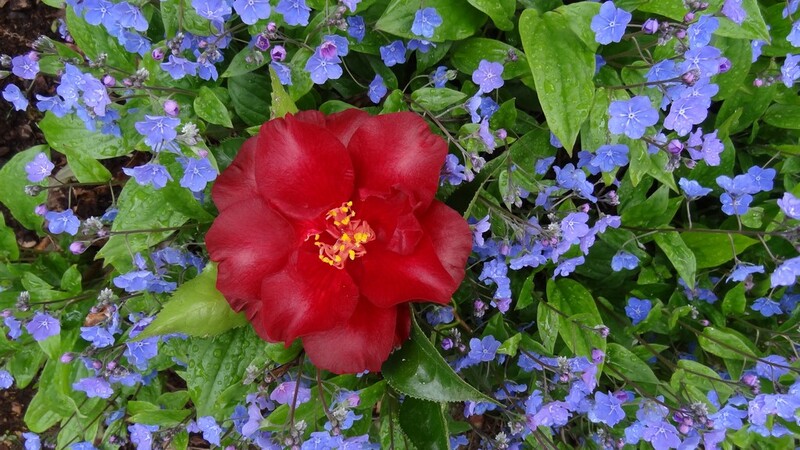 Gossler is two-timing me with the 'Shirazz' listing since I don't grow it anymore, but maybe he likes the name better than 'Geisha Gone Wild'. Gossler lists Arisaema flavum which he calls, “Not a showstopper, but a fun plant in late summer when the red seeds appear.” I would agree with that. 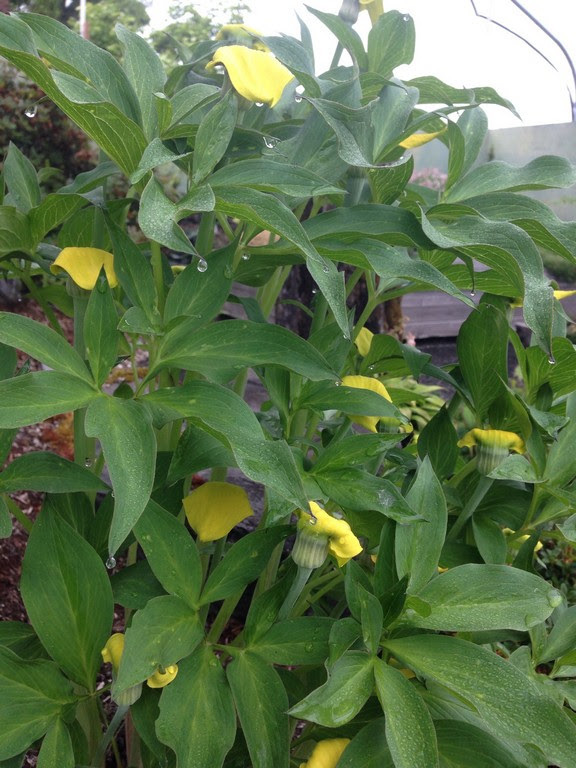 The yellow flowers are small and are hidden by the dark green leaves, but if you paw through the foliage to find them they are as interesting as any aroid. 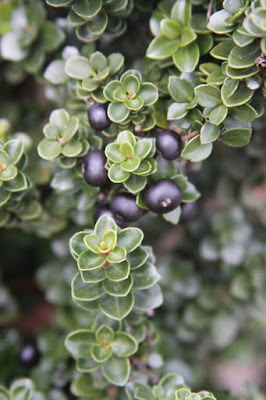 A. flavum is native to eastern Africa and southern Asia and it is somewhat edible and used as a famine food. You can get a 1 gallon pot from Gossler for only $15.00 which makes it a fairly inexpensive meal. 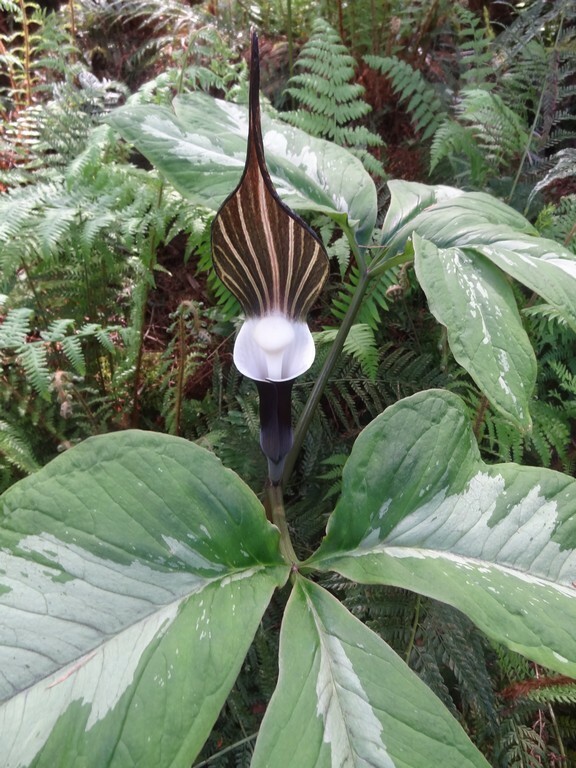 Gossler calls Arisaema sikokianum's Silver foliage form “simply amazing.” It is the Japanese “Jack in the Pulpit” and comes from the island of Shikoku, the smallest of Japan's four main islands. 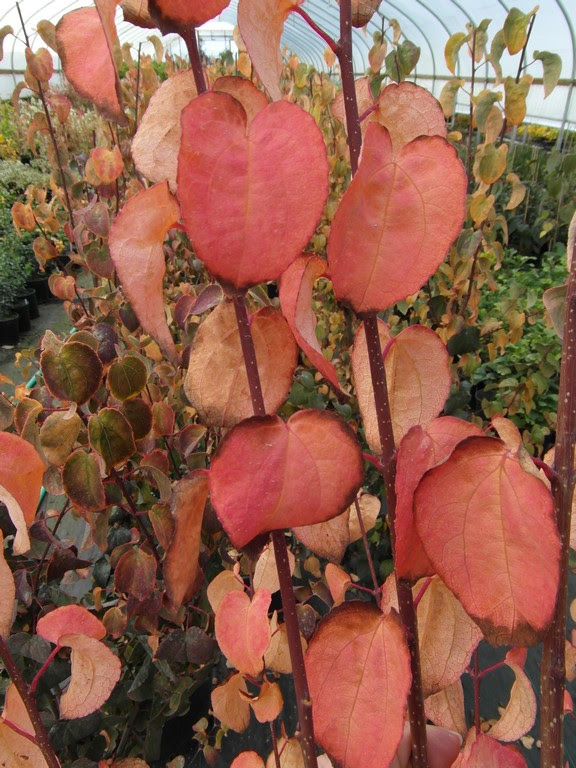 I used to grow Cercidiphyllum japonicum 'Heronswood Globe', in fact I provided grafts to the now defunct Heronswood Nursery for a couple of years. 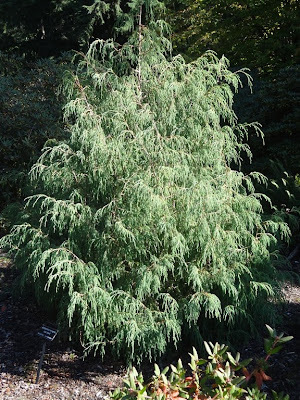 The photo above is of the original seedling – 15 years ago – in Washington state but I don't know if it currently exists. 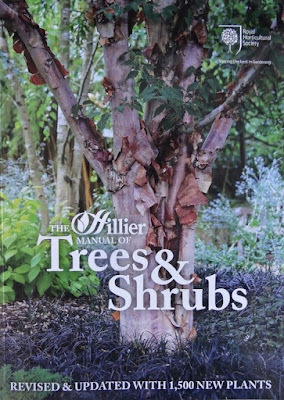 The Hillier Manual of Trees and Shrubs lists it, surprisingly enough, calling it a “slow-growing bushy dwarf selection.” My experience was that it was vigorous, too vigorous, and that all grafts would eventually grow into upright trees. Another problem was that no one would buy my trees so I wasn't overly sad when my one last specimen was cut down for outgrowing its place in the garden. I attempted to root 'Heronswood Globe', for that would certainly reduce its rate of growth, but I never got any to strike root. 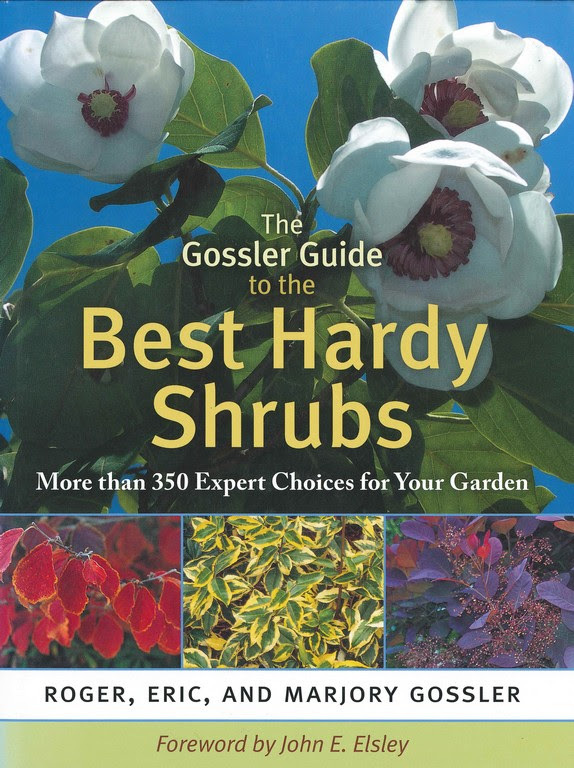 Anyway, I'm not going to order one from Gossler; but I don't mean to be negative – you should if you have room. I might order a Desfontainia spinosa 'Heronswood', and I assume the cultivar epithet refers to its introduction from the aforementioned Heronswood Nursery. The spinosa species (“Chilean holly”) is one of three found in Central and South America and it was introduced by William Lobb from Costa Rica in 1843. 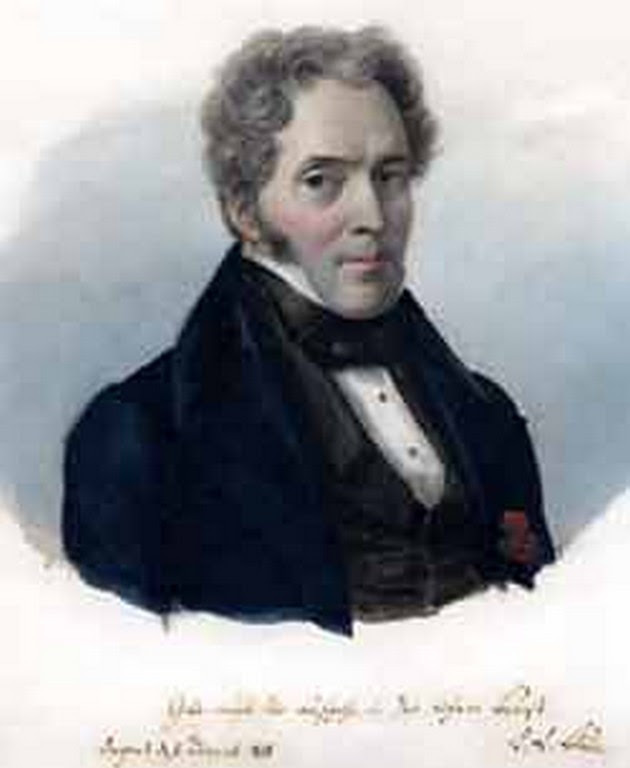 The genus was named for the French botanist René Louiche Desfontaines (1750-1833). 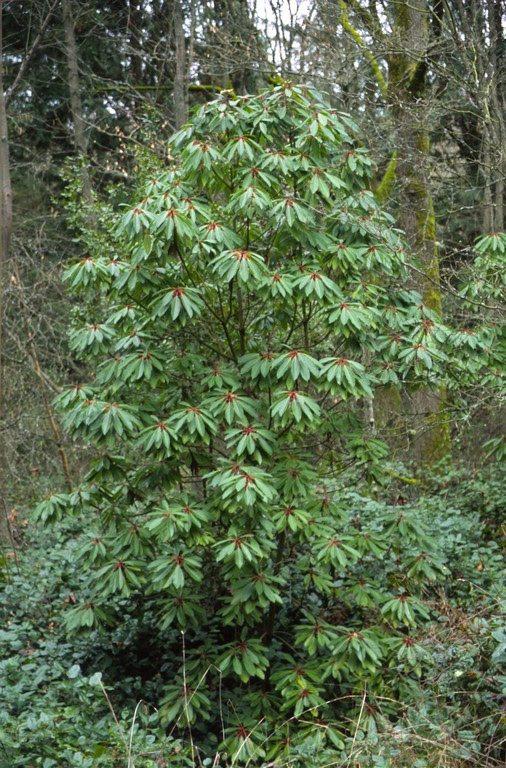 I would probably have to keep my plant inside a greenhouse as it is probably a USDA zone 8 plant, although I know one grows outdoors at the Rhododendron Species Botanic Garden in Washington state (it always looks crappy though). One of D. spinosa's common names is Borrachero de Paramo or “intoxicator of the swamp,” and the Columbian shamans of the Kamsa tribe make a tea “to dream” or to see visions and diagnose diseases. Others report that the tea will “make you go crazy.” One thing is certain: you don't want your doctor to be drinking the concoction! 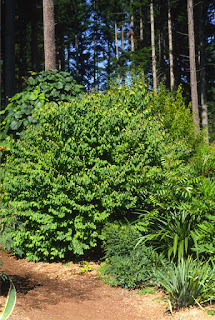 Daphne genkwa is the “lilac daphne,” and it is a deciduous shrub from China, Taiwan and Korea. It was introduced from China in 1843 by Robert Fortune, the spy and thief who also stole tea plants and tea-processing information from the Chinese. Gossler offers the “show stopper” form called the Hackenberry Group, a clone or clones with lighter-colored flowers than the type, at least in our nursery. 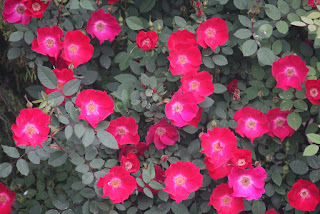 This “group” arose as seedlings raised by Don Hackenberry from seed originating in the wild in China, collected by the Beijing Botanic Garden. 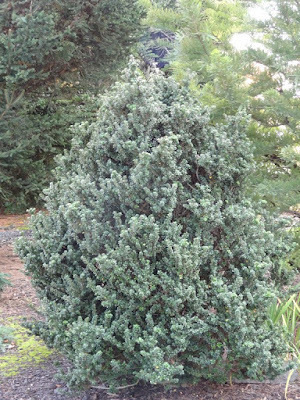 I notice that Gossler lists Juniperus recurva 'Coxii'. 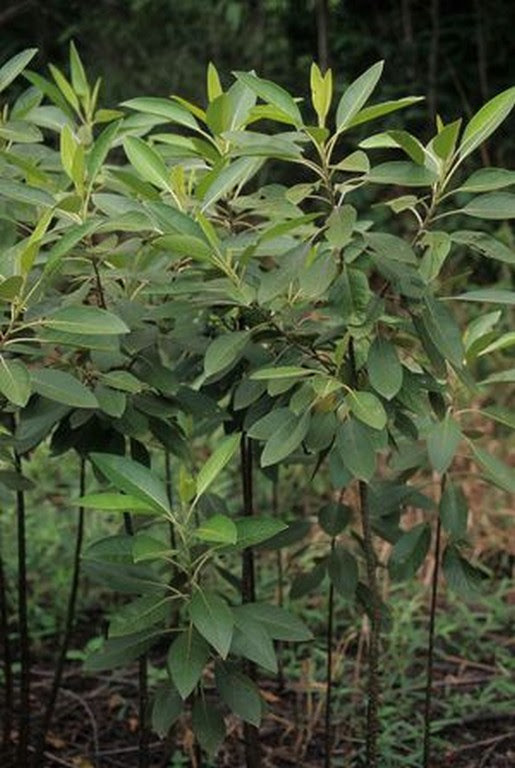 Most of the literature does not regard Coxii as a cultivar, but rather as a variety – so var. coxii with a small “c.” Hillier describes it as “An elegant small tree with gracefully drooping branchlets which are longer and more pendulous than the typical variety.” Just two weeks ago I saw a healthy gorgeous specimen at the Rhododendron Species Botanic Garden. What a coincidence since I cut my oldest (25-year-old) tree down from the Upper Gardens the day before because I concluded that my arboretum is not a hospital for unattractive, struggling trees. My coxii suffered this past winter at near 0 degrees F, and in our brutal summer's heat it declined even further. Nothing is more unbecoming than a sickly old juniper, but still it was difficult to pull its plug. 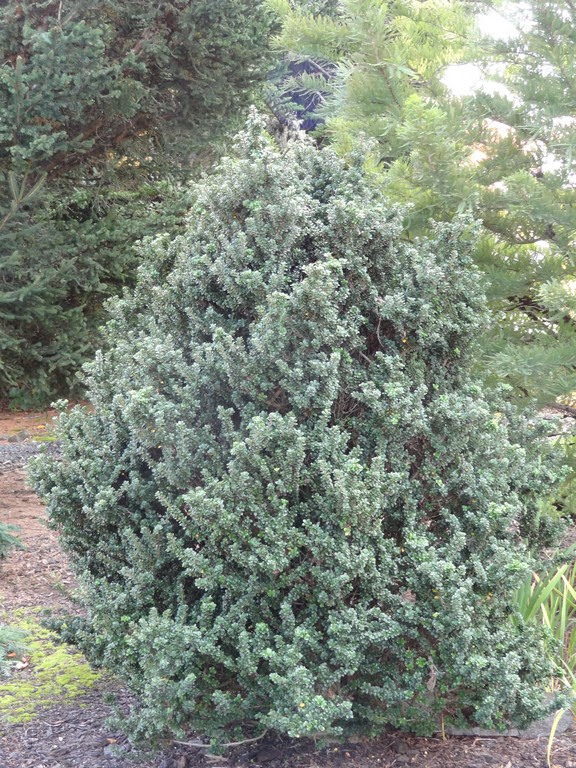 My old specimen was grafted onto Juniperus scopulorum 'Skyrocket'. I suppose Roger sells plants that are on their own roots – either from cuttings or from seedlings. In any case $24.00 is a steal for a 2-gallon pot, but only if you garden in a climate a little warmer than I do in Oregon. 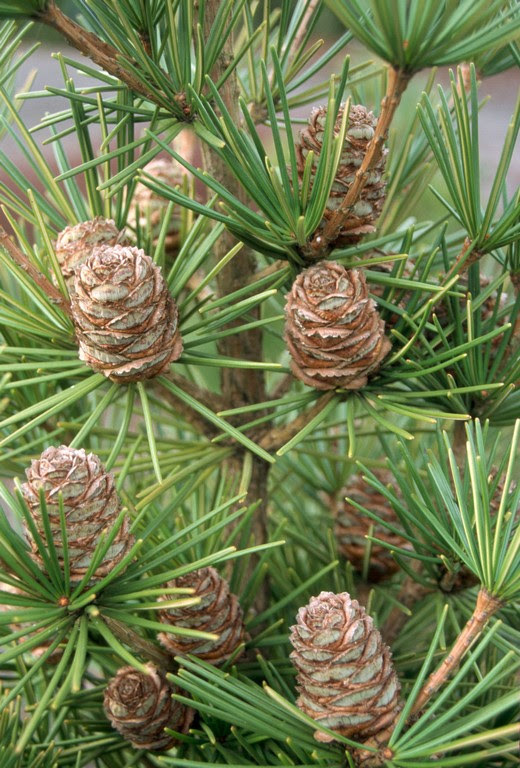 For what it's worth, Debreczy/Racz in Conifers Around the World (2011) gives coxii species rank, and state, “It is morphologically similar and has been considered a variety of J. recurva, but recent molecular studies support its treatment at species rank.” The name coxii is due to its discovery and introduction by E.H.M. 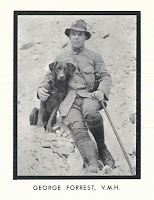 Cox and Reginald Farrer from Upper Myanmar in 1920. 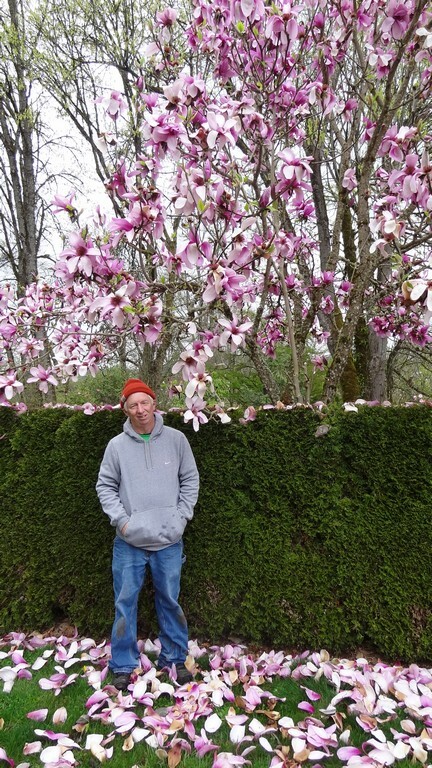 Gossler Farms Nursery has always specialized in magnolias, and the visitor to their Springfield, Oregon location will be treated to enormous flowering specimens in spring. In fact, our office Manager Eric Lucas has been growing magnolia from Gossler long before he came to work at Buchholz Nursery. Of Magnolia 'Burncoose' Roger states that “we got our original scionwood from Dr. Corbin's garden in Portland.” And so did I. Dr. Corbin received scionwood from various sources in the magnolia vanguard, then he would graft them onto the canopies of older established trees, thus having his new cultivar – such as 'Burncoose' – flower profusely in just a couple of years. The skinny doctor would climb into his trees at an advanced age to perform the graft...which was quite a sight. Naturally his wife fretted below, but the doctor loved to display his climbing prowess. Magnolia 'Burncoose' originated at the Burncoose Nurseries in Cornwall, England as a seedling from Magnolia sprengeri var. sprengeri 'Diva'. 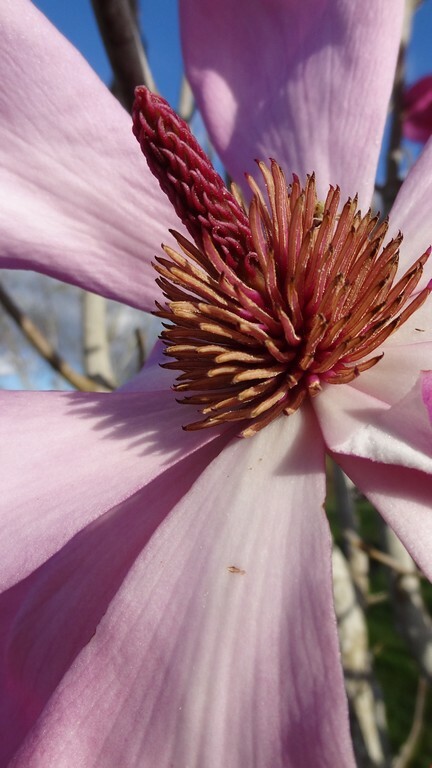 Gossler Nursery is famous for its introduction of Magnolia kobus var. stellata 'Jane Platt'. The late Mrs. Platt was well-known for her tasteful, artistically inspired garden in Portland, Oregon. 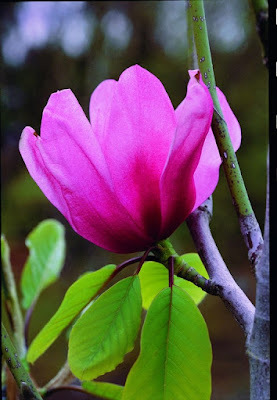 In it was a magnolia grown as M. stellata 'Rosea', but Roger Gossler recognized it as being superior – a stronger pink – than the typical var. rosea. 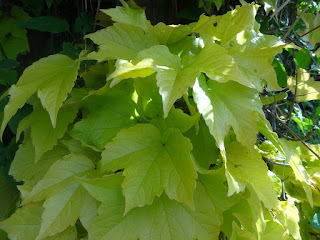 He writes, “One of the finest plants we have ever found. We named this glorious plant for our friend and mentor back in the 80's. 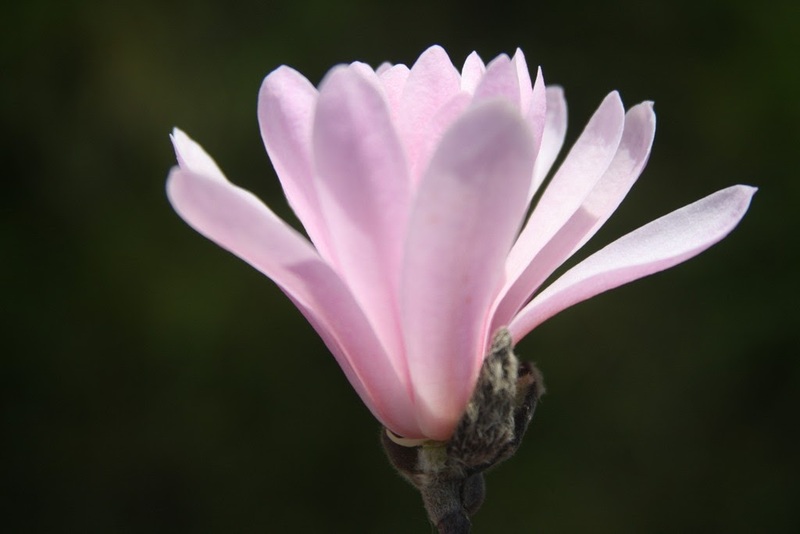 This star magnolia can have 60 tepals that are a pretty light pink. We are thrilled that M. 'Jane Platt' received an Award of Garden Merit from the Royal Horticultural Society.” The flower color can vary somewhat from year to year, but I agree that this large shrub/small tree is one of the finest plants that one can grow. I purposely planted one along the driveway to my home and it is stunning when blooming in the afternoon light in late April. Gossler lists Omphalodes 'Cherry Ingram' which is named for the English gardener Collingwood Ingram (of flowering cherry fame). I had to look up Omphalodes for I wasn't familiar with the genus. When Roger describes it as a low-growing perennial (1' tall) with brilliant blue flowers in March-April, then I recalled seeing it in his garden on early spring visits. I didn't know what it was then and I didn't think to ask. Now I think I would like one and he charges only $10.00 for a 1-gallon plant. 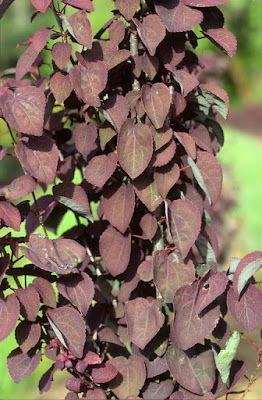 I don't know how O. cappadocica 'Cherry Ingram' differs from the type but it did win an Award of Garden Merit. It is commonly called “navelwort” due to the shape of the seeds, as omphalos is the Greek word for “navel.” It is a cousin to the Forget-me-not and is also called Blue-eyed Mary. Parthenocissus tricuspidata is known as “Boston ivy” even though the species is native to Japan, Korea and China. It was introduced from Japan by J.G. Veitch in 1862. 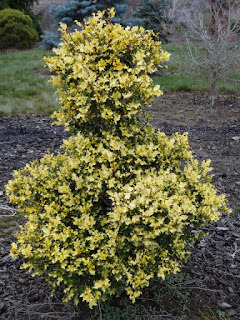 Gossler offers 'Fenway Park', a gold-leaved form of the climber and says “Our plant is in full south facing sun and thrives.” It was discovered as a sport on the normally green ivy in 1988 by Peter Del Tredici of the Arnold Arboretum. And no, it wasn't found in Fenway Park – home of baseball's Boston Red Sox – but rather on an apartment building near Fenway Park. 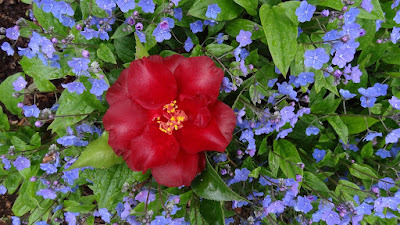 I had seen it for sale in retail garden centers but never thought much of it, but after seeing 'Fenway Park' cover an entire building at Shadow Nursery in Tennessee a few years ago, I was impressed enough to get one for my plant collection. The botanic name is a mouthful, but comes from Greek parthenos meaning a “virgin” and kissos meaning “ivy” while tricuspidata means “three-toothed” in reference to the leaves. The reason for a Gossler blog is because of the new catalog, but also by coincidence they picked up an order yesterday from us and Roger gifted me a Quercus macrolepis 'Hemelrijk Silver'. Hillier (2014) lets us know that the oak is now Q. ithaburensis ssp. 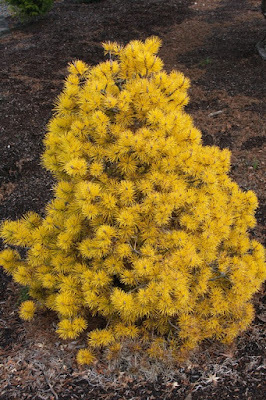 macrolepis, "a small to medium-sized tree with grey-tomentose twigs." 'Hemelrijk Silver' was grown from seed collected on the island of Rhodes by Robert and Jelena de Belder, a famous plant couple from Belgium, the late owners of Arboretum Kalmthout near Antwerp. Roger doesn't know the trees' eventual size, but assumes that it's not huge as his grows 6-12" per season. In any case I've got plenty of room at Flora Farm and I hope to get it in the ground next week. Last year Gossler gave me a Rosa moyesii 'Geranium', and in his catalog he claims, "This is the true R. moyesii 'Geranium' (there are many imposters). 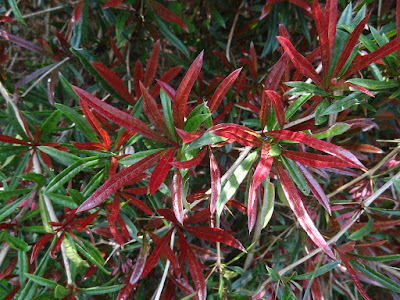 A 10-12' shrub with single red flowers (Red is only a general description. It is really different red). In late summer-fall the hips turn a glorious peachy orange." 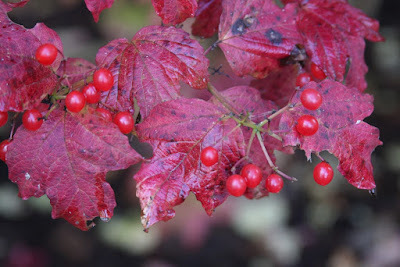 Hillier explains further that 'Geranium' is a hybrid of R. moyesii "which it resembles, but slightly more compact in habit..." Also the fruits are said to be slightly larger and smoother. "Raised at RHS Garden Wisley in 1938. 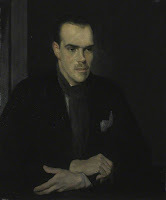 AM 1950." 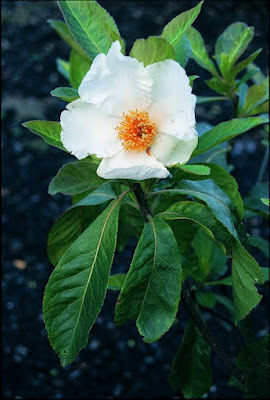 R. moyesii is native to western China and it is commonly known as "Mandarin Rose." 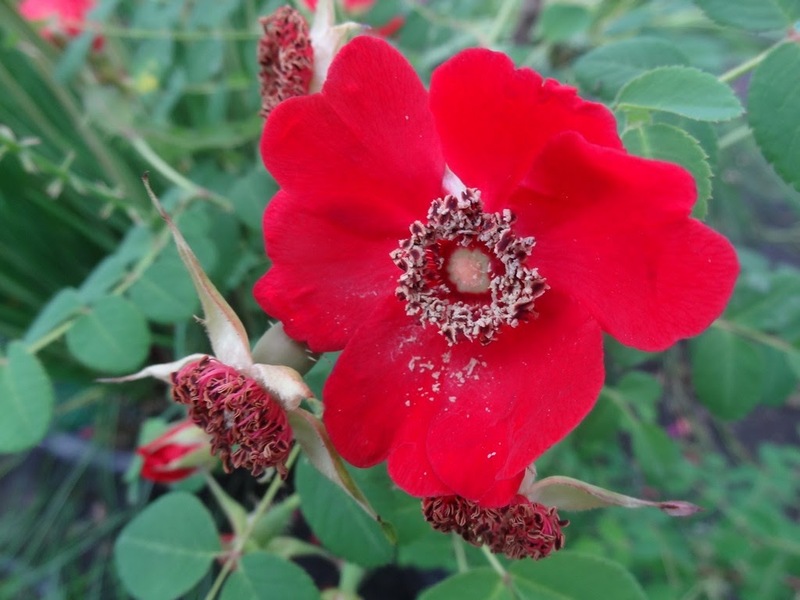 The American Rose Society wrongly claims that the species was discovered and introduced by E.H. Wilson, but it was first discovered in 1893 by A.E. Pratt, and then introduced by Wilson in 1903. 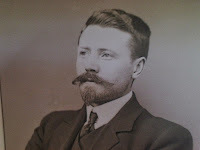 Wilson was collecting for the Veitch Nursery firm, who first exhibited it in flower in June 1908. 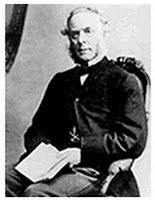 The specific name commemorates the Reverend J. Moyes, a missionary in China whose Protestant organization encouraged members to wear Chinese dress and sport pig-tails to impress the locals who were undergoing the conversion attempt. 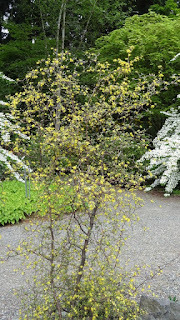 I wouldn't want a Viburnum opulus 'Aureum' in the middle of my Display Garden, but I am most happy to have it growing in a semi-wild state down by the pond. 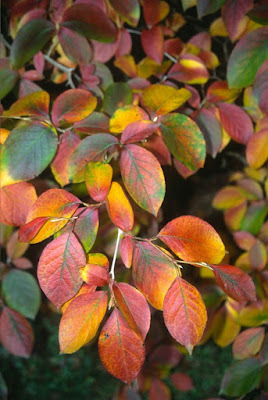 Gossler says, "This Viburnum has golden leaves from April-October." 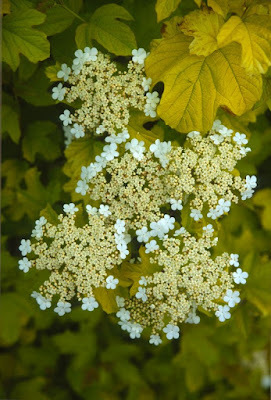 The white lace-cap flowers are mainly lost in the golden foliage, and I know that many Junes have come and gone that I have missed them in bloom. 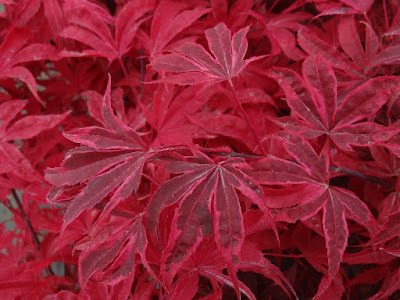 Ah well, the rosy-red leaves are attractive in early fall, then they turn to absolute purple by November. If grown in shade the leaves will be lemon-green, but if placed in full sun they can burn (in Oregon) so wise siting is important. Viburnum opulus is commonly known as the "European cranberry bush" and sometimes as "cramp bark" as its medicine can help regulate cycles and relieve menstrual cramps. Yikes! – glad to be a guy. 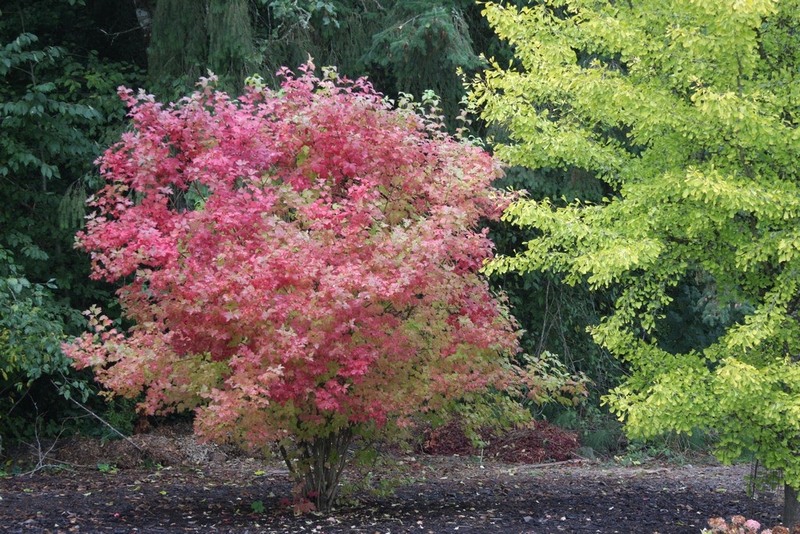 It's obvious by now that Gossler Farms Nursery offers a wide selection of choice garden trees and shrubs. 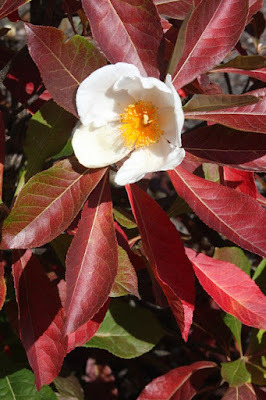 One genus that is well represented is Stewartia, in fact some would go so far as to call them snob trees. They aren't cheap, but the species and cultivars offered must be considered. S. pseudocamellia 'Pewter' was discovered by Guy Meacham of PlantMad and it features green leaves with a silver sheen. 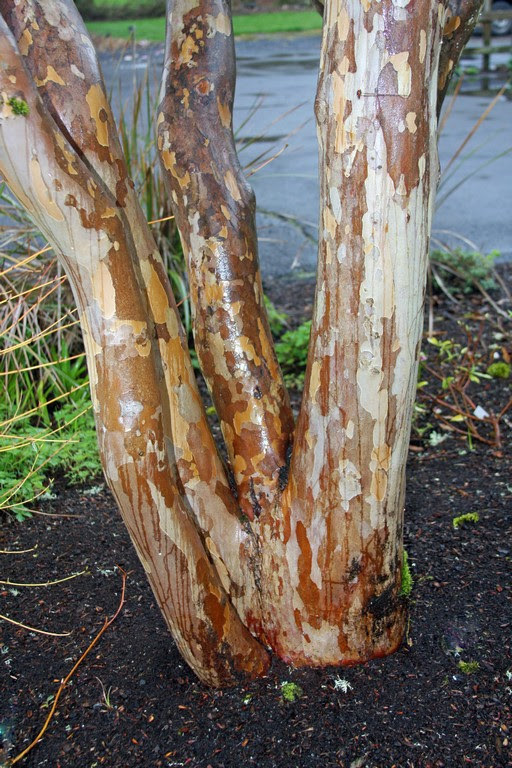 S. pseudocamellia 'Pillar Bella' was discovered by Oregon's Crispin Silva and it's grown for its columnar form. Silva also discovered S. sinensis 'Gardens Guardian', and after 12 years the full bushy original is only 6' tall by 2' wide. You can also buy a Stewartia koreana, and a 50-year-old specimen in Eric Gossler's yard shows off its red autumn foliage that "can be seen for a quarter mile away." Hillier classifies it as Stewartia pseudocamellia Koreana Group and describes its bark as giving the "effect of beautifully marked snakeskin," and the species (or "variety" or "group") was introduced by E.H. Wilson on the Korean peninsula in 1917. Inviting Roger into our garden to be a "garden coach" was one of our best horticultural investments. He has an almost endless amount of information regarding plant growth and habit. His depth and knowledge on what to plant where, why, when and how was a great help to us. And, perhaps most important, it was wonderful fun. A visit from Roger would leave us quite excited about new plant possibilities. 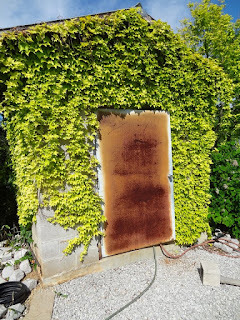 In a few words and wild hand gestures, he could turn an ugly shady corner bed into a colorful hydrangea planting that would be beautiful and hide the shed wall and fence. We will continue to use the garden coach service and we know that each visit from Roger will be enjoyable and full of new information. Surprisingly this year's catalog didn't make mention that you can also purchase Gossler's book, The Gossler Guide to the Best Hardy Shrubs Timber Press (2009), but I'm sure that they still have plenty of copies in their closets. This book goes far beyond my blog to reveal the Gossler experience, and I have read it word for word at least three times. Running a nursery is a tough profession, but when you consider your plant friends, like Roger, it is a wonderful experience.